Expectations are high for The Snowman, the first film adaptation of Jo Nesbø's books about Harry Hole. The film will be released in Norwegian movie theatres on 13 October, but it is already evident that it will get a substantial visual boost from Norwegian nature in all its wonderful, snowy splendour. 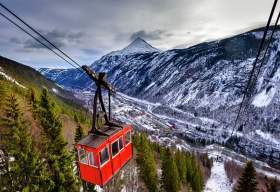 And featuring most prominently of all - at least based on clips from the movie - is Rjukan, the sparsely-populated administrative centre of Tinn municipality in Telemark county, Norway. The first impression from The Snowman for audiences outside of Norway will probably be from this specific area. The internationally-distributed film poster depicts a gun-yielding Harry Hole trudging through the snow on what appears to be a frozen Tinnsjøen Lake in the direction of something that menacingly casts a red light onto an otherwise all-white background. Other local spots that lend the film a wintry feel are Rjukan town centre, Rudsgrend and Hydro's facility at Vemork. "The heart of the film is at Rjukan. They came here for the spectacular scenery. You just won't find anything equal to it in Bergen or Oslo," says Pål Thorud, Chief of Hydro's hydroelectric power station in Telemark, Norway, in a press release. "For us at Hydro, it was important to demonstrate good will," says Thorud. "We want to facilitate the process. 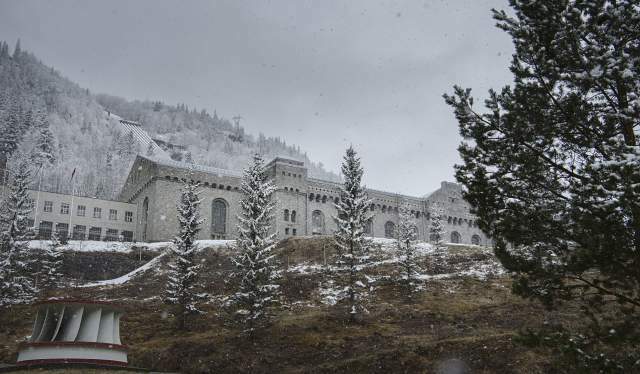 It is important for Rjukan and the World Heritage sites to promote themselves." In the role of the hard-nosed, disillusioned, and drink-loving police detective Harry Hole is the Irish movie star Michael Fassbender who is known from roles in Prometheus, 12 Years a Slave and several of the X-Men films. In an interview with NRK Evening News earlier this year, Fassbender revealed that he got to take part in a typically Norwegian tradition for the first time in his life in Rjukan. "I went skiing for the first time in Rjukan. I have only fond memories from there. It was an awesome shoot." Fassbender does not hold back in his praise about his stay in Norway. "It is perhaps one of my favourite jobs that I did. We had a lot of fun," he boasts. Snap from my first day on set of SNOWMAN in Norway. I play a very small part but it&apos;s fun to be around great actors like Michael Fassbender, Toby Jones and Rebecca Ferguson. The wet snow came in so fast I was almost blown over the cliff! For several weeks, there were 150 film people and over 1,700 extras buzzing around Tinn and the surrounding areas, and the locals helped out with such tasks as moving large amounts of snow when the need arose towards the end of the shoot. However, the small community's cooperation on the big production will be rewarded on 11 October: That's when The Snowman will have its world premiere in the town square at Rjukan ... two days before the film can be experienced anywhere else. In addition, several other Norwegian locations are recognizable when Harry Hole moves onto the big screen. Oslo locations include the Barcode area, the City Hall, the Vigeland Sculpture Park and Hole's favourite restaurant Schrøder is represented while Bergen offers their local pride, Mount Ulriken, and the spectacular views of the city it provides. It would seem that Norwegian settings are in demand as filming locations in general terms. 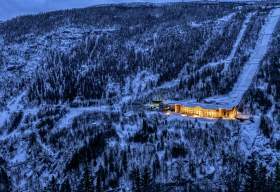 The Valldalen Valley and Juvet Landscape Hotel on the north-west coast of Norway were recently nominated for the Best European Film Location Award for the visual role the area played in the British-produced Sci-Fi thriller, Ex Machina (2015). The cube-shaped, glass hotel and surrounding countryside are competing against 10 other nominees, ranging from the Greek island of Antiparos to the Val Senales glacier in South Tyrol. The winner will be announced in the European Parliament in Brussels on 7 November.